Tropical paradise is the norm when you book a stay at Fort Myers Beach RV Resort. Our impeccably landscaped grounds, clean facilities and unbeatable Ft. Myers location make this Florida RV park a place to remember. Speaking of unbeatable location, guests at our Fort Myers RV campground have access to nearby islands like Sanibel and Captiva. Spend a day exploring the beaches of Southwest Florida or stay put and relax at the resort. 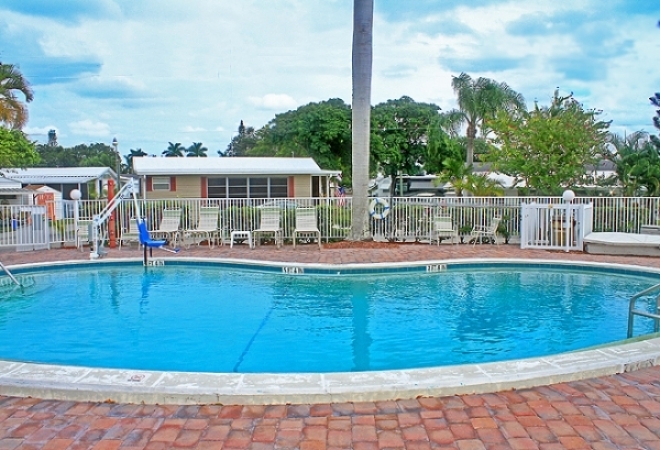 At Fort Myers Beach RV Resort, an array of activities and amenities are available to all of our guests. Swim laps in our heated pool, work up a sweat in the fitness center, or spend a day at the spa. For bookworms, find something to read in our library. Get ready to sit back, relax and enjoy the Florida sunshine and tropical breezes. The staff at Fort Myers RV Resort looks forward to hosting your next Florida getaway.